Click "Get GWid" to read more information about the methods and to retrieve your personal GWid. If you are an individual with an active NetID account, you may use this option to find your GWid. This option will only work if you are a new student who has officially accepted an offer of admission but has not yet registered for courses. 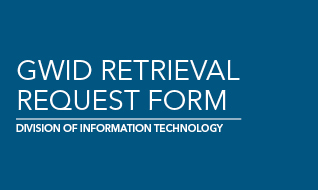 If you are not able to retrieve your GWid using the option above, please call the IT Support Center at 202-994-4948 for assistance.